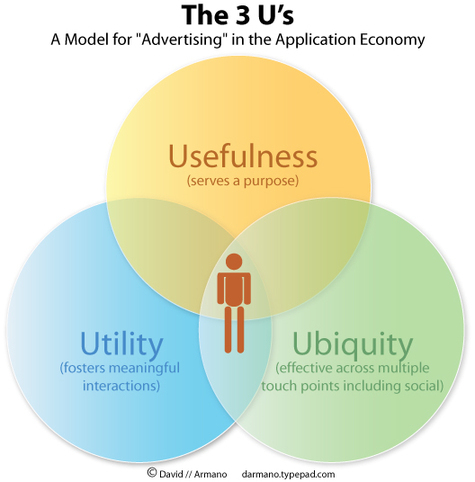 I'm updating some thinking on the "3 U's". The word and idea of "Unity" doesn't quite work even though there is some overlap in my thinking. So here's another take swapping the idea of "ubiquity" for "unity". Seems more appropriate. Let me know what you think. Any experience is useful when it's meaningful and serves a purpose. Currently much of marketing still breaks down into self-serving gimmicks and interruptions that offer little value. Much of what's offered in digital is no exception. While the majority of criticism is of traditional advertising, the fact of the matter is that interruptive based traditional digital advertising is not much better. These are the digital gimmicks that work to get your attention but are usually done so poorly that they offer no value whatsoever. Usefulness is the exact opposite. Utility = interaction that delights us in some way. But hold the iPhone. The industry has hijacked the word delight and brainwashed us to think that only companies like Apple and Disney are capable of serving it up. Let me tell you a story about the "no-frills" Craigslist, which just happened this morning. My wife took pictures of a large playset we wanted to sell. She uploaded them at 10:00 A.M. By noon, she had several people interested and she sold the set in time for a late lunch. We had the set dismantled, picked up and were $100.00 richer that evening. That's delight in the application economy. We are living in a fragmented world with what seems like infinite touch points available to us. Brands and businesses who can distribute value across these endless touch points in effective ways will tap into new markets and solidify existing ones. Even though some of us are interacting through multiple social channels—we can now find people just like ourselves who we trust and see what they like/dislike. This influences our decisions from the stuff we buy to the things we recommend to each other. The best marketing in the world tries to simulate this, but usually ends up coming off as contrived. Meaningful interactions through multiple networks and channels leads to authentic word of mouth references and ultimately affinity.